Hello everyone! Thank you for hopping by each and every week. 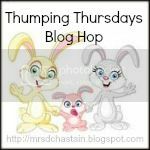 With 135 Hoppers last week, Thumping Thursdays was the place to be! If you are new here, I would just like to say Welcome! Thank you for hosting this blog hop. I love your design. I know it's not quite new, but I think I forgot to mention it when you got it. Sorry. Thanks for hosting us again Diana! Do have a super blessed Merry Christmas! Hi there! I'm a newbie to the blog hop! Love it! Oh my goodness! what a wonderful surprise!! Thank you so much for the feature! Just love your hops! Just linked up and now I'm off to do some hopping!! Thanks for hosting, & may you and your family have a blessed Christmas! I'm always ready to hop on by. Hi sweetie, followed your blog. I hope you follow back! Thanks! Hey there!! I am visiting from Everday Harvest blog hop!! I look forward to reading your blog in the future! !